His resignation has to be seen against the growing war fever in Washington—which is now reflected in White House policy. 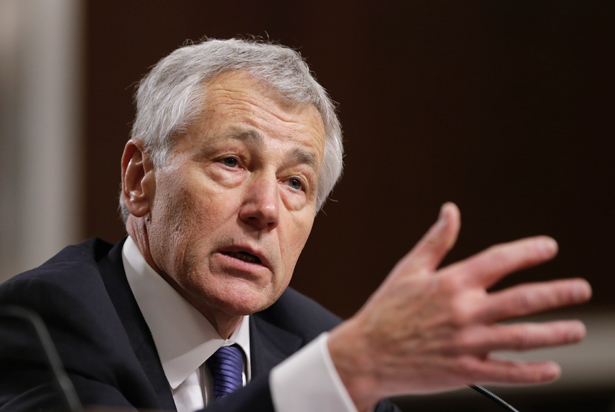 Secretary of Defense Chuck Hagel’s surprise resignation has largely been ascribed to his lack of assertiveness on key issues and a frosty relationship with President Obama, but it must be seen against a backdrop of growing war fever in Washington. Although Obama has been noticeably reluctant to become militarily involved in Iraq, Syria and Ukraine, he is coming under increasing pressure from both Democrats and Republicans to employ tougher measures in all three. Hagel is believed to have supported such moves in private conversation with the president, but he has not done so in public. By replacing him now, Obama appears to be signaling his intention to adopt a more activist military posture through the appointment of a more vigorous secretary. Hagel, a former enlisted soldier who served in Vietnam, is well liked by combat troops but was never fully welcomed by Obama’s inner circle. Moreover, he had faced strong opposition from Senate Republicans during his confirmation hearing—in part for remarks alleged to be anti-Semitic or insufficiently supportive of Israel—and so entered the administration with diminished political clout. As secretary, he has largely embraced White House policy on Iraq, Syria and Afghanistan, but without conspicuous ardor. In fact, “don’t do stupid stuff” is a perfectly valid organizing principle, placing the onus of persuasion on those who advocate aggressive overseas actions (see Klare, “Why Hillary Clinton Is Wrong About Obama’s Foreign Policy”). But it is not a particularly compelling argument for winning public support in what appears to be an especially threatening moment—and one in which irresponsible Republican war-mongering fills the airwaves. The fact that the current chaos in Iraq is largely a product of the misguided invasion undertaken by President Bush in 2003 doesn’t seem to register in this hothouse atmosphere. With public concern over ISIS and its brutal tactics (including the beheading of two Americans) on the rise, and with few in Washington willing to back his stance, Obama has upped the ante in Iraq, Syria and Afghanistan. In September, he announced the onset of an extended air campaign against ISIS in Iraq and Syria, along with the deployment of 1,500 US military advisers to help rebuild the shattered Iraqi army; on November 7, three days after the midterm election, he announced the deployment of an additional 1,500 advisers. On November 21, moreover, The New York Times revealed that Obama had approved an extended combat mission for US forces in Afghanistan. And while the president has repeatedly stated that he has no intention to deploy US combat forces in Iraq—no “boots on the ground,” as it is put—senior military officials, including chairman of the Joint Chiefs of Staff Gen. Martin Dempsey, have indicated that planning is under way for just such a move. “I’m not predicting at this point that I would recommend that [Iraqi troops] would need to be accompanied by US forces, but we’re certainly considering it,” he told the House Armed Services Committee on November 13. Whatever Obama’s hesitations, it is becoming increasingly evident that he sees no recourse but to order ever more aggressive action in Iraq and Syria—not only against ISIS, but also against the Assad regime. The Republicans in Congress, soon to assume control of the Senate, are already beating the war drums, calling for increasingly vigorous moves. At an appearance at the Halifax International Security Forum on November 22, Senator John McCain—soon expected to assume the chairmanship of the Armed Services Committee—called for a larger military presence in Iraq, more support for anti-Assad forces in Syria, a semi-permanent US military presence in Afghanistan and expedited arms deliveries to the Ukrainian military. For six exhausting years, President Obama has sought to reduce Washington’s reliance on military action to secure its major objectives abroad. As recently as last May, he famously told graduating cadets at West Point, “Just because we have the best hammer does not mean that every problem is a nail.” But now, with the resignation of Hagel and the escalating US role in Iraq and Syria, it seems that he has chosen to lift the hammer.